When you talk about tango, something that immediately springs to mind is playful vibrancy and deep energy between two people. It is certainly one of the oldest and danced in both traditional and modern style and has a deep foundation of connection, improvisation and expression. It is one of the dances that is aptly described as a very passionate dance for several reasons with the most prominent the history of the dance, that music’s character as well as the close connection evident between the dance partners. At the Argentine tango’ heart is a deep desire to converse through movement, understand and listen to your dance partner in this unique dance language. It is a dance that has any different meanings to the people who dance and those watching the couple too. It is a dance that almost anyone can do, as the music choices for tango are wide and diverse. 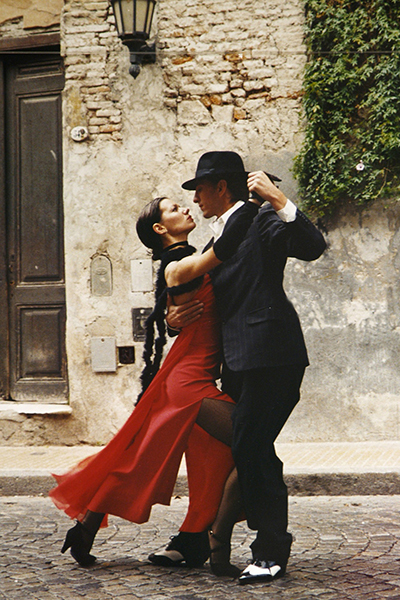 In tango you have the leader and the follower and it is through embrace that a leader offers is invitation to his follower in how to step and where. During the leading and the following, the dance is born with both parties maintaining connection and harmony with the music and through embrace. Tango is easily compared to the symbols of yin and yang with both parties involved having a bit of the other one within and thus a collaborative process that strongly encourages developing of respect, trust, clarity and sensitivity. Speaking to both beginner and advanced as well as professional tango dancers they are all of the same opinion, in a sense that you “live” the dance and see no future or past, only the constant flow of music and two partners. Dancers understand each other and you share a connection and moment of intimacy that you do not find present in any other dance.